Hands on: Sony Xperia Z2 tablet review | What Hi-Fi? Enter the Z2 Tablet - the world's slimmest, lightest waterproof tablet - announced at MWC 2014 alongside its newest flagship smartphone, the Xperia Z2. The Z2 Tablet borrows fairly heavily from the Tablet Z's design, but is just a slimmer, lighter version of it – 0.5mm thinner and 69g lighter to be precise. With a 10.1in screen, this is no small tablet, but its seriously slim and light frame helps to make it easily portable, not to mention comfortable and easy to hold. Sony's angular-edged OmniBalance design is back in a similar way to on the Z2 smartphone, and feels somewhat toned down, with edges feeling less harsh and slightly more rounded. The Z2 Tablet feels every bit the premium device - it doesn't have the tempered glass back panel like the Z2 smartphone, but instead features a matte, soft-touch material that helps in making the tablet easier to hold for long periods, even if it is trickier to keep free of fingerprints. As before, waterproof and dustproof protection is on board with this tablet, which is always a welcome addition. You're perhaps less likely to drop your tablet down the loo than your phone, but it does protect it from spills and even opens it up for House of Cards catch ups in the bath, should you be so inclined. The Sony Z2 Tablet has the same 10.1in IPS display as its predecessor, and perhaps rather disappointingly, it has the same resolution too. At 1920 x 1200 and 224ppi, it falls behind competitiors like 2048 x 1536 iPad Air and 2650 x 1600 of the now year-old Nexus 10, which have really pushed boundaries when it comes to screen technology. When we were using it, we didn't feel like we were missing out on any pixelly goodness, and the bigger screen size is great for movies, but we suspect that put next to one of its competitors and it could lose out in the sharpness stakes, particularly with video and text. Of course, this lesser resolution will put less pressure on the processor, so could well add to the smooth running of the tablet that we experienced in our brief hands on time and improved battery life. That's something we'll be able to tell you in our full review. Sony's Triluminos and X Reality technology for mobile are piled into the Z2 Tablet, as is Sony's new Live Colour LED tech, which aims to widen the colour gamut for better colour and gradiation without oversaturation by adding in additional red and green phosphers to the LED display. The display certainly packed plenty of punch to colours and showed a good handle on contrast too – we'll be seeing how much these technologies help it against the competition in our full review. The Z2 Tablet features the same 2.3GHz quad-core Qualcomm Snapdragon 801 processor as its smartphone counterpart, currently the fastest processor availabilie in a tablet, and 3GB of RAM. It moved smoothly under our touch, opening apps and moving around them quickly and without lag – from our time with it, there were certainly no usability concerns. We particularly like to see Sony's continued commitment to pulling back from an overly heavy handed skin over the Android 4.4 KitKat operating system. Swiping through the menus, the interface feels clean and there's not too much in the way of bloatware, save for the expected additions. Of course, Sony has packed its Music and Video Unlimited services on there, as well as PlayStation Mobile, and if you're buying into the Sony architecture, they're certainly worth a look, as they are well stocked and well integrated. In particular there's a new feature called "What's New", which is able to offer you movie, music, game and apps suggestions based on your previous user habits, but it only works using Sony's content. The Z2 Tablet comes in wi-fi and 4G/LTE versions, and will be available in 16GB and 32GB, but features that all important microSD card slot for bumping this up by another 64GB. Other features of note include an IR blaster along the top edge for controlling other devices in your home and a 6000mAh battery, which Sony is claiming should offer a 10 hour battery life. Like the Z2 smartphone, Sony has made the move of bringing its stereo speakers to the front, either side of the display, though it's not as if you'd spot them without taking a good look - they're not a design statement like on the HTC One, for example. Of course the aim here is to improve headphone-free sound by making it more direct, and less likely to be obscured while you're holding it. We still thinks some careful hand placement is necessary to avoid covering them up, and while the sound is certainly clearer than a speaker placed round the back, we're still convinced headphones is the way to go for the best, most balanced sound. You'll be able to do that via the 3.5mm headphone jack mounted along the bottom edge of the tablet. Since the Tablet Z, this has been waterproofed too, so no longer requires a waterproof flap, which was annoying to remove and replace every time. The digital noise cancellation we saw over on the Z2 is also at work here, and Sony's MDR-NC31EM noise-cancelling headphones are included with the tablet too. It's largely successful, from our first impressions, taking out a lot of the ambient noise around us for a much more involving, uninterrupted listening session. Quiet periods in music will struggle to keep all of the outside from coming in, but compared with having the technology turned off, there's quite a difference. We look forward to testing these under our own conditions in our full review. We'll keep this brief, as cameras on tablets are not one of our favourite things. They're nice to have for when you really need to get a quick snap, but otherwise, there are better and more accomplished ways to do it. The Z2 Tablet offers a perfectly respectable 8MP camera, with 2.2MP front facing snapper for making video calls – the very same as was offered on the Tablet Z. The camera app is fairly well stocked, with a number of modes and effects to play with, though there is no 4K video mode as we saw over on the Z2 - just in case that was a tempting feature for you. 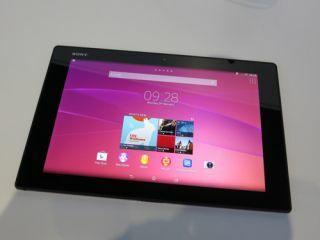 Sony has unveiled a number of interesting accessories to use with the Z2 Tablet, some of which are worth a mention. These include the BSC10 Bluetooth speaker dock, which will both charge your device and pump out tunes via its built-in 10W speaker. It can also be used as a speakerphone device as well. The BRH10 Bluetooth remote will let you control your device from afar, whether docked or not, and also doubles up as a handset to make calls on, should you wish. We wonder if you might feel a little silly doing the latter, but it's a nice additional functionality for making Skype calls a little clearer, perhaps. Last up is the BKC50BT Bluetooth keyboard cover, which helps to make the Z2 Tablet that little bit more productive for big typers. Connecting via Bluetooth and NFC technology as with the other devices, the cover also works as a stand and a protective cover when you're done, though as its metal, it does add a bit of weight to the device. The Sony Z2 Tablet is a great looking 10in tablet, with that extra screen space making it great for movie watchers, and its slim and light body making it a easy to use and carry around with you. We're not sure tablets can get much slimmer than this. It seems like a good little performer too, with that speedy Snapdragon processor under the hood, while waterproof smarts are always a good feature to have on board for the clumsy among us. However, that decision to not bump up the screen resolution on its latest tablet could well be its biggest battle in a year where we expect manufacturers to continue pushing the bar on screen resolution and technology. Only time will tell. We're looking forward to putting it and all its new screen tech through its paces in our full review, very soon.